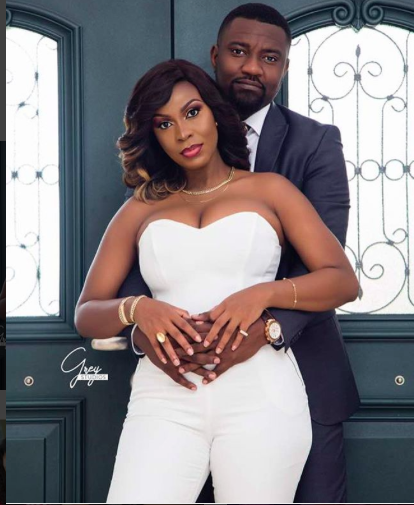 Honestly, we can’t get over pictures of John Dumelo and his wife, Gifty Mawunya.John Dumelo tied the knot over the weekend. Actor, John Dumelo married girlfriend, Gifty Mawunya. Furthermore, it was a traditional wedding ceremony. The ceremony happened at her parent’s house at Spintex. Several top Ghanaian celebrities showed up to support their fellow colleague. Aside from these stars, other prominent personalities in the society were also at the traditional marriage ceremony. Also, ex-president Mahama and many other influential people in the country were at the event. Top stars at the event included Jackie Appiah, Majid Michel, Yvonne Nelson, Ramsey Noah from Nigeria, Prince David Osei, Edem, Coded, Yvonne Okoro, A-plus and many others. Mawunya is the sister of Selassie Ibrahim. She’s also bestfriends with Nadia Buari. Moreover, new photos of the couple are out. It seems they went to church for thanksgiving. They both wore white and honestly looked divine.